Sources within Hamas tell Egypt rocket attack which injured 7 in central Israel was not intentional, say they plan to probe incident. Officials from the Gaza-based Hamas terrorist organization claim that the rocket fired on central Israel early Monday morning was accidentally launched, denying the incident was a deliberate attack on Israel. 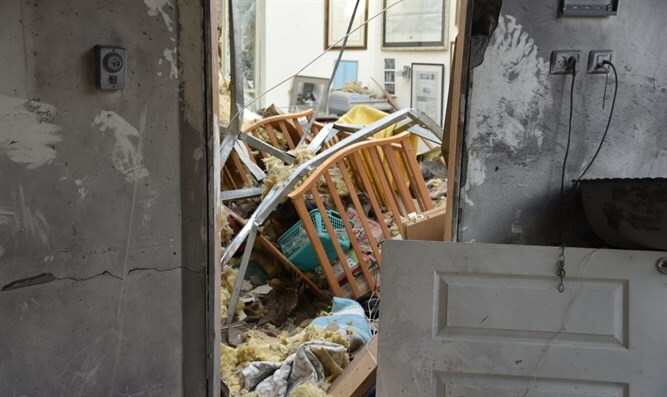 The rocket fired Monday morning landed in the Sharon region in central Israel some 50 miles from the Gaza Strip, hitting a home in the Moshav Mishmeret. A 60-year-old woman was wounded by shrapnel and suffering burns from the rocket’s explosion, leaving her in moderate condition. A 30-year-old woman is also said to be in moderate condition after suffering shrapnel wounds. Five others are listed in light condition. Prime Minister Binyamin Netanyahu announced Monday that he would be returning home early to Israel from Washington, cancelling a planned address at this year’s AIPAC conference. In a statement released from Washington Monday morning, Netanyahu vowed to “respond forcefully” to the rocket fire. "Several minutes ago I concluded a telephone update and consultation with the Chief-of-Staff, the head of the ISA Director and the head of the NSC. There has been a criminal attack on the State of Israel and we will respond forcefully. In light of the security events I have decided to cut short my visit to the US. In a few hours I will meet with President Trump; I will return to Israel immediately afterwards in order to manage our actions from close at hand."